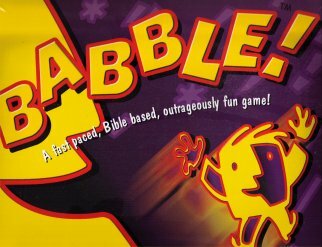 The BabbleÂ® Board Game is an exciting new Bible game with a fresh style of play. Every player draws two cards and start calling out the words on the cards at the same time. Wait, did someone just yell "cross"? Yes! A match! Both players place their matching cards together. One player grabs a die and rolls it while the other player calls out "odd" or "even". If the guessing player guesses right, that player gets the match. If not, the player rolling the die gets the match. The player with the most points after six rounds is the winner! The game contains six decks of cards, each deck being a different category, and eight colored dice.